We are strongly committed to minimize the impact on the environment reducing the amount of packaging required by our solutions, while maintaining the benefits in terms of safety, long-term preservation of products, reduction of product waste, and using more recyclable and compostable materials. Area #1 will be dedicated to our sustainable packaging where visitors will be able to experience the benefits of ULMA's most environmentally friendly solutions. 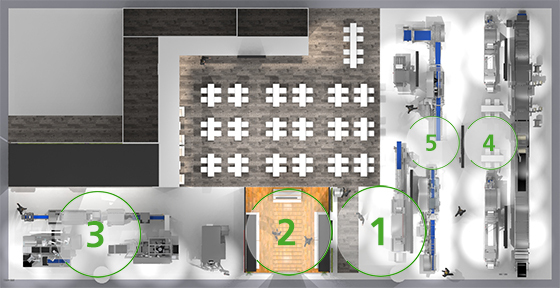 Area #2 will be dedicated to show our best packaging solutions from all over the world. Samples sorted by industry where visitors can check packaging trends from different countries. Area #3 will be dedicated to automation solutions with a traysealing complete line and a collaborative robots cell. Area #4 will introduce ULMA's digital offer through our new UPC 4.0 platform for ease of operation, assistance for maintenance, remote connectivity and increased productivity. We know how important it is to ensure that your equipment operates with maximum efficiency, to bring added value to your business. Area #5 will be dedicated to Service. Please look out for our next newsletter where we will share some details about our equipment at the stand and our latest sustainable packaging developments.